My name is Iveta Pirovska, I'm living in Sofia and would like to introduce you my kennel "ORCHIDE IN BLOSSOM" for small white kleinspitz. It's a small kennel with great ambitions. The dogs live together with us in a family environment. 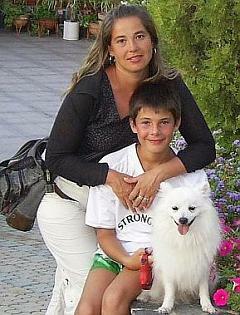 Me and my 12 year old son Yoan give all our love to our favourite breed. Why small white kleinspitz? It's extremely cheery and beatiful dog with great devotion to its proprietor. Undoubtly it is also the rarest colour of the big spitz family. Long-living and unpretentious, suitable for growing in an apartament. And an interesting fact - the small white kleinspitz is a dog that doesn't smell at all. I'm very interested in this breed since 2005. After that I spent long months in searching for the appropriate dog for me, contacted with many kennels and studied hundreds of pedigrees. In the end I fixed on a kennel in Moskow and after a long waiting on 18.09.2006 DORSDORF AMARILIS (ELF) came to us - it's a heir of the most award winning white kleinspitz in the world. I'd like to introduce you briefly to its ancestors. It's grandfather DORSDORF ELF WHITE it the most award winning dog of this breed not only in Russia but also in the world. 11 times winner on the great exhibitions Eurasia, European and World champion, champion of France, Austria, Russia, Moldavia, Poland, Finland, RCF, Grandchampion, champion NORDIK WINNER 2005, 4 times champion of ICB (International Club of the Breed - НКП). Its father DORSDORF SHIKO also has extremely successful exhibition career: champion of Finland, Russia, ICB, Grandchamption, 5 times candidate for interchampion. My DORSDORF AMARILIS isn't dropped behind its parents. It's young champion of Bulgaria, young champion of Macedonia, club champion and champion of Bulgaria. The dog was awarded as best young dog of 2007 year. Derived the exellent breed qualities and proud character, it is about to continue proving itself on the exhibition rings and having a generation in a fitting manner to its high class!